There is no joy in Jersey as the NJ Knockouts fell Wednesday night to their perennial rivals, the New York Knights, who have now been responsible for ending all three Knockouts seasons in the US Chess League. But with Kenilworth Chess Club champion Yaacov Norowitz playing for New York, our club will definitely be cheering on the Knights into their final match against the Miami Sharks (date to be announced). I have annotated the games and posted them in a java replay page. You can also download my PGN file to do your own analysis. Norowitz's win over Sean Finn on Board Four looked like a foregone conclusion early on, even before it ended in mate (see first diagram below for an easy puzzle). But the other games were sharply contested and, at least on Boards One and Two, could have gone either way. On Board One, GM Joel Benjamin struggled with time pressure in his game after GM Georgi Kacheishvili turned the tables on his "opening surprise" Fantasy Variation against the Caro-Kann (1.e4 c6 2.d4 d5 3.f3!?) with the equally surprising 3...Qb6!? But Benjamin definitely had the advantage for most of the game and probably missed a winning blow at move thirty (see second diagram below for a challenge). On Board Two, IM Dean Ippolito also had the advantage out of the opening against GM Pascal Charbonneau in a wild line of the Rubinstein Variation against the Four Knights (1.e4 e5 2.Nf3 Nf6 3.Nc3 Nc6 4.Bb5 Nd4! 5.Bc4 Bc5!? 6.Nxe5 Qe7!) 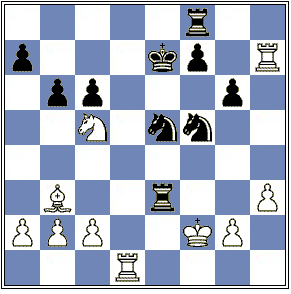 Ippolito sacrificed a piece for a dangerous attack, prompting Charbonneau to sacrifice his Queen for counterplay. Ippolito definitely missed at least one stronger continuation that would have gained a clear advantage for Black, but eventually Charbonneau used his initiative to gain a clear edge and even a material advantage. Though Ippolito missed a beautiful line that would have forced a draw by perpetual check (see last diagram below), he eventually got a draw anyway. Board Three saw Mackenzie Molner playing a wild line of the Najdorf that Matt Herman clearly knew better. Eventually, only Herman had any attacking chances, but with the win secure on Board Four he appears to have decided not to take any chances and to play for an easy draw, which Molner, short of time, eventually offered himself. White to play and mate in two. 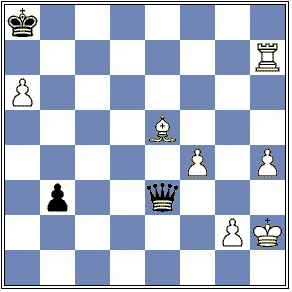 Black to play and force a draw. So the Jersey boys only have themselves to blame for the loss, especially considering that they had draw odds. Better luck next year. And "Go Norowitz and the Knights!" Let's hope they don't have to play on the Sabbath!